City on the Rise: Public Art in Covington, Kentucky. Our walls are changing for the better. Propelled by the global phenomenon of street art and sustained by an embrace of community-sanctioned murals, public art is back in a big way. In Cincinnati, when it comes to public art, the name ArtWorks is ubiquitous. With a hundred murals in thirty-six neighborhoods, formerly drab walls are becoming multi-story canvases, transforming the streets into a public gallery space. Across the river in Covington, a city celebrating its bicentennial, ArtWorks is a more modest presence, sharing the responsibility of bringing art to public spaces with a number of homegrown initiatives. A six-minute walk will take you from the Madlot to Randolph Park, where The Licking River Greenway and Trails begins, an urban pathway that will eventually cover an estimated twelve to fourteen miles, connecting Covington, Taylor Mill, Wilder, and Newport. The trails, still in development, have already been graced by a number of art projects, but the occasional cluster of spent spray cans is a testament to the fact that not all of the public art is sanctioned. 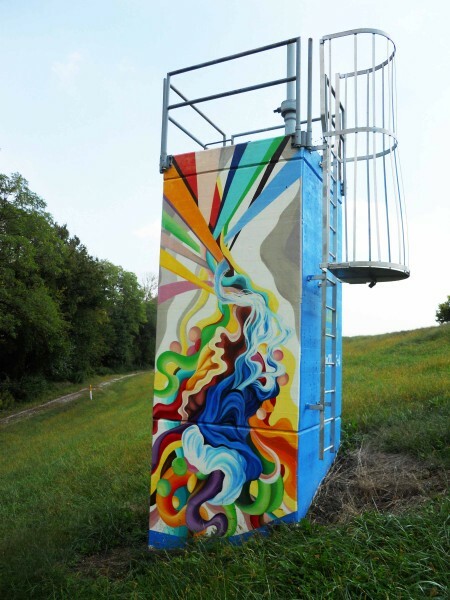 Jim Guthrie, who created the art is… project in response to tagging along the Licking River Greenway & Trails, wanted to create designated spaces for graffiti that would be open to anonymous writers and would consequently deter tagging in unauthorized locations. The Licking River Greenway and Trails, LRGT for short, is peppered with gatewells—structures built into the river side of the levee to regulate water flow. The murals on the LRGT, created through a partnership between ArtWorks and Vision2015 (now Skyward), are painted on a number of these gatewells, while other structures have been designated for use by graffiti artists. Unfortunately, at times the taggers color out of the lines, hitting locations that are technically off-limits. Natalie Gardner, the Programs and Strategic Projects Manager for the City of Covington, says that any vandalized murals will likely not be restored until Phase Two or Three of the project, when the levee trails are paved and the additional foot traffic will help protect the integrity of the funded murals. 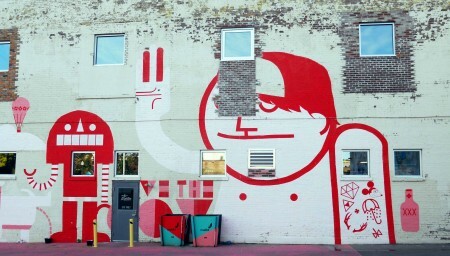 In addition to his work with art is…, Guthrie recently coordinated a mural project at Glenn O. Swing Elementary School with the support of a grant from The Center for Great Neighborhoods of Covington, an organization dedicated to positive growth within the city. 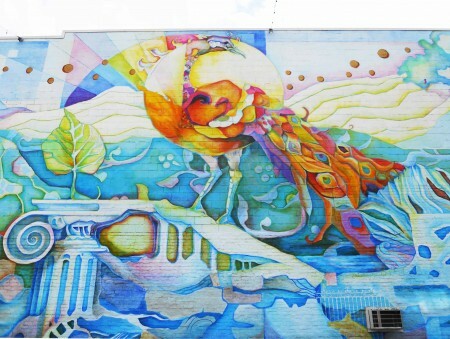 The mural, titled “Try Together / Fly Together,” was painted by Matt Hebermehl, a Savannah-based artist and co-founder of SeeSAW (See Savannah Art Walls). Prior to beginning work on the mural, Hebermehl led a discussion on art in the public realm. On the second day of painting, Glenn O. Swing threw a community party to celebrate the completion of the mural. Just a week later, Guthrie was busy establishing a graffiti wall at Art Off Pike, Covington’s annual arts festival. The appeal of Covington has been further improved by BLDG’s fine arts efforts. 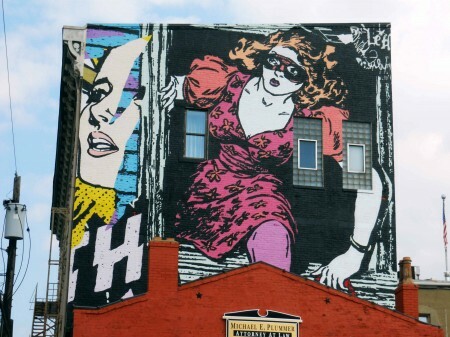 In recent years the city has been visited by internationally-recognized artists like Vhils, The London Police, and Faile. The London Police, a duo famous for their iconic LADS characters, have visited Covington twice, creating a walking tour of their pieces in 2013. Vhils, who did a residency at BLDG in 2011, is renowned for his unique approach to street art. Rather than adding layers of paint, he chisels walls away to create his remarkable pieces. His portrait of Tim Dwight, President of Motch Jewelers in Covington, can be found at 5th and Plum in Cincinnati, on the side of what was formerly the Mainstay Rock Bar. The portrait is like a flag planted in Cincinnati’s midst, a little rebellious gesture from its neighbor to the south. Discussing their various projects, Jay Becker, a partner at BLDG and the husband of Cate Becker, stresses the importance of community building. 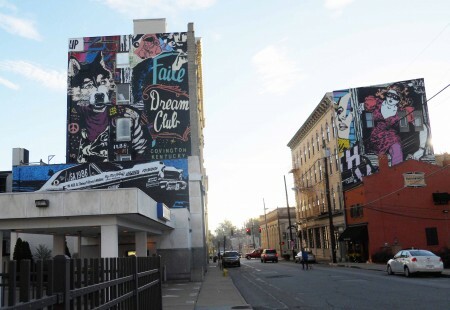 “We’re trying to add cultural value to Covington,” he says, “but we’re also looking at the creation of a destination.” In Covington, there’s no greater art destination than “Around the Corner,” a multi-building, multi-story mural created by artist duo Faile last year. Putting this project together was no simple task. Much of downtown Covington lies within a historic preservation zone. The mural, which appears on the back walls of both the Republic Bank and Donna Salyers’ Fabulous-Bridal, sits in the Downtown Commercial Historic Preservation Overlay Zone, and thus required a Certificate of Appropriateness from the Department of Development in Covington. 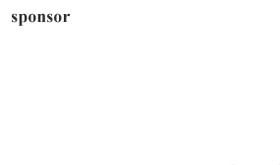 Fortunately the project was approved, and everything moved quickly from there. According to Cate Becker, it had to. “Sometimes it’s almost fly by the seat of your pants. So they (Faile) called up and were like, ‘We’ve got time three weeks from now in September,’ and we’re like, ‘Okay, let’s roll.’ And they came down three weeks later, we got a boom lift, and they got on the wall. It took about nine days. We had a very short period of time, and dawn till dusk type of painting. 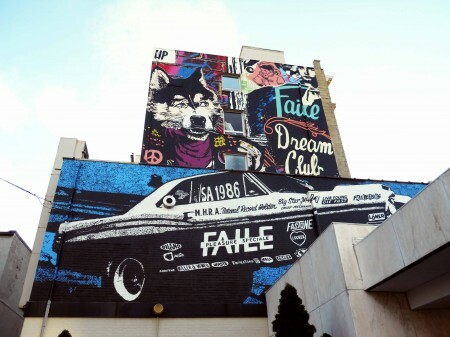 It was really very cool to watch, and see it evolve and come to life.” What makes Faile’s foray into Covington so special? 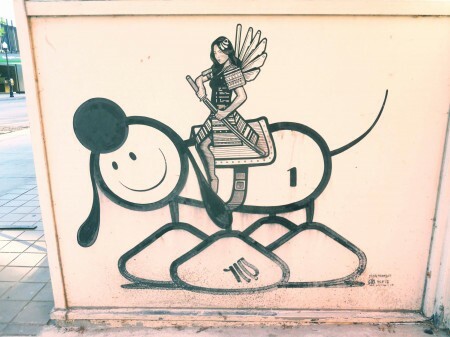 As Cate Becker points out, over the past few years Faile has done murals in Bethlehem, Tokyo, Rwanda, and Covington. They are a leading presence in the public art scene and they have a tremendous global following. By arranging this mural, BLDG has certainly brought Covington closer to becoming a destination city. In an article published last spring, Cincinnati Magazine writer Jenny Burman referred to a past in which Covington was viewed as “the Tijuana to Cincinnati’s San Diego—an over-the-border badlands frequented by northern neighbors looking to indulge in the darker passions.” Though the rebellious spirit of Covington is still very much alive, its image has softened somewhat over time. Walking its historic streets, there’s a real sense of life, spirit, and adventure. Whether you’re seeking out traditional images like The Roebling Murals, painted on a flood wall visible from the Roebling Bridge, or looking for something in the urban contemporary vein, Covington is well worth the visit.